Each manuscript will be primarily examined by the editor and those selected for inclusion is then forwarded for double-blind peer review by members. 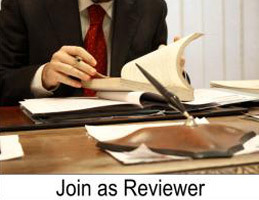 On the basis of these reviews the research paper shall be published subject to recommendation of referees. Accepts the paper for publication with no changes. Accepts the paper for publication with only minor changes. Accepts the paper for publication provided it is amended in line with the reviewer's comments. Rejects the paper as unsuitable for publication. The author's shall be informed about the selection/rejection of the article/paper by e-mail only. The rejected papers shall not be returned. In case of acceptance of the article, journal reserves the right of making amendments in the final draft of the research paper to suit the journal's requirement. Whether intentional or not, plagiarism is a serious violation. Plagiarism is the copying of ideas, text, data and other creative work (e.g. tables, figures and graphs) and presenting it as original research without proper citation. We define plagiarism as a case in which a paper reproduces another work with similarity and without citation.